Z. Faskova, R. Cunderlik, K. Mikula, R. Tenzer, Influence of Vertical Datum Inconsistencies on Gravity Field Modelling. Influence of vertical datum inconsistencies on gravity field modelling. In Reference Frames for Applications in Geosciences : Proceedings of the Symposium. Marne-La-Vallée,4.-8.10.2010. International Association of Geodesy Symposia, Vol. 138, Berlin: Springer Verlag, 2013, s. 205--213. R.Cunderlik, K.Mikula, M.Tunega, Nonlinear diffusion filtering of data on the Earth's surface, Journal of Geodesy, 2012, DOI 10.1007/s00190-012-0587-y (Download PDF). M. Macak, K. Mikula, Z. Minarechova, Solving the oblique derivative boundary-value problem by the finite volume method, ALGORITMY 2012, 19th Conference on Scientific Computing, Podbanske, Slovakia, September 9-14, 2012, Proceedings of contributed papers and posters (Eds. A.Handlovicova, Z.Minarechova, D.Sevcovic), ISBN 978-80-227-3742-5, Publishing House of STU, 2012, pp. 75-84 (Download PDF). M.Sprlak, Z.Faskova, K.Mikula, On the application of the coupled finite-infinite element method to the geodetic boundary value problem, Studia Geophysica et Geodaetica, Vol. 55 (2011) pp. 479-487 (Download PDF). 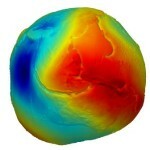 R.Cunderlik, K.Mikula, Direct BEM for high-resolution gravity field modelling, Studia Geophysica et Geodetica, Vol. 54, No. 2 (2010) pp. 219-238 (Download PDF). Z.Faskova, R.Cunderlik, K.Mikula, Finite element method for solving geodetic boundary value problems, Journal of Geodesy, Vol. 84, Issue 2 (2010) pp 135-144 (Download PDF). R.Spir, R.Cunderlik, K.Mikula, Riesenie geodetickej okrajovej ulohy so sikmou derivaciou metodou okrajovych prvkov (Solution of the geodetic boundary value problem with the oblique derivative using the boundary element method), Proceedings of the conference Mathematics, Geometry and their Applications MAGIA 2009, Kocovce, Slovakia (2009) (Download PDF file in Slovak). M.Tunega, R.Cunderlik, K.Mikula, Filtracia geodetickych dat na povrchu Zeme pomocou nelinearnych difuznych rovnic (Filtration of geodetic data on the Earth surface using nonlinear diffusion equations), Proceedings of the conference Mathematics, Geometry and their Applications MAGIA 2009, Kocovce, Slovakia (2009) (Download PDF file in Slovak). R.Cunderlik, K.Mikula, M.Mojzes, Numerical solution of the linearized fixed gravimetric boundary value problem, Journal of Geodesy, Vol. 82, No. 1 (2008) pp. 15-29 (Download PDF). Z.Faskova, R.Cunderlik, J.Janak, K.Mikula, M.Sprlak, Gravimetric quasigeoid in Slovakia by the finite element method, Kybernetika, Vol. 43, No. 6(2007) pp. 789-796 (Download PDF). R.Cunderlik, M.Mojzes, K.Mikula, A comparison of the variational solution of the Neumann geodetic boundary value problem with the geopotential model EGM-96, Contributions to Geophysics and Geodesy, Vol. 34, No. 3 (2004) pp. 209-225 (Download PDF). R.Cunderlik, K.Mikula, M.Mojzes, 3D BEM application to Neumann geodetic BVP using the collocation with linear basis functions, ALGORITMY 2002, Conference on Scientific Computing, Vysoke Tatry-Podbanske, Slovakia, September 8-13, 2002, Proceedings of contributed papers and posters (2002) pp. 268-275 (Download PDF). R.Cunderlik, K.Mikula, M.Mojzes, The boundary element method applied to the determination of the global quasigeoid, ALGORITMY 2000, Conference on Scientific Computing, Vysoke Tatry-Podbanske, Slovakia, September 10-15, 2000, Proceedings of contributed papers and posters (2000) 301-308 (Download DOC file).